Driving your INFINITI Q50 through Long Beach, Torrance, and Fullerton and seeing a new warning light come up on the dashboard can be unsettling. Luckily, not all Q50 dashboard lights are causes for concern. To help you quickly ID that new light in question, learn more about your vehicle, and get it the care it needs, Cerritos INFINITI created this digital dashboard light guide to the INFINITI Q50. If the dashboard light is red, orange, or yellow, it’s considered a warning light for a system issue. Unless otherwise indicated, these lights require the prompt attention of an INFINITI-certified dealer. Anti-lock Braking System (ABS) warning light: If you see the letters ABS appear on your dash while driving, or stay on for more than a few seconds at startup, there’s an issue with the system that may turn off the anti-lock function of the brakes. Check that the parking brake isn’t engaged. Follow your owner’s manual procedure for checking the vehicle’s brake fluid level; if low, add fluid. If the light remains lit, seek certified assistance. Charge warning light: This dashboard light that looks like a little red battery box warns that there’s an issue with the vehicle’s charging system or alternator. Malfunction Indicator Light (MIL): The MIL’s icon looks like the outline of an engine compartment and represents the vehicle’s emissions control system. If you see this symbol light up and stay steady, check that the gas cap on your vehicle is secured. A blinking MIL is indicative of an engine misfire. Drive with caution (under 45 MPH) to your nearest INFINITI service center. Seat Belt and Supplement Air Bag warning lights: Upon startup, you’ll see two lights that depict seated passengers come on. One depicts a front view of a passenger that’s seated and buckled, and the other shows the side view of a passenger with a solid circle, representative of an airbag. Seek assistance if either of these lights remain lit for more than seven seconds, or appear while driving. If the dashboard light is blue, white, or green, it simply means that the associated system is functioning properly. Regardless, it’s a good idea to get to know what these lights mean so you can confidently drive and operate your Q50. Exterior light indicator: This pair of small green lights will come on when the head light switch is set to AUTO. High Beam indicator light: This indicator looks like a bulb with straight rays coming out of it, indicating that the headlight high beams are on and will go out when the low beams are selected. Security indicator light: This light depicts the outline of a car with a key inside of it and will blink when the car is turned off or placed in the accessory or locked positions, showing that the security system is working. 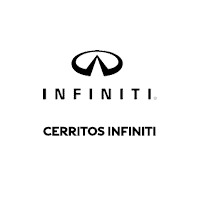 Clear Your Dashboard at the Cerritos INFINITI Service Center. We hope this quick guide to the INFINITI Q50’s warning lights and indicators helped you find a solution to your Q50’s dashboard light in question. If you still haven’t found a resolution, or need to find a qualified INFINITI dealer in the Long Beach, Torrance, and Fullerton area to assess or correct the system, sign up for a service appointment with Cerritos INFINITI’s highly trained technicians today.